In short, we must assume, as George Washington believed, that most people want to do the right thing and will do the right thing if they have good information. Maxwell proposes we provide good historical information by moving away from history curricula based primarily on “knowing” and “remembering." We should not be requiring the memorization of massive amounts of historical information easily find on a smart phone when needed. Whether you teach European history, United States history, or some other historical topic, works of art are a great tool for helping students gain a more sophisticated understanding of history. The purpose of this blog is to suggest one approach for helping history students analyze works of art. Although the approach might seem simple, it is nevertheless quite effective at helping students learn to reach historical conclusions on their own. Once you have selected a work of art, ask students to analyze that work and then use their analysis to reach conclusions about the topic they are studying. You might, for example, choose Pablo Picasso's Guernica to help students better understand the rise of European fascism during the 1930s. Follow my two recommendations below and you should be able to create lessons that not only engage students but also help them become independent thinkers. First, students should be provided with enough background information that they can place the work of art in historical context. In the case of Picasso’s Guernica, I might, for example, provide students with a little information about the Spanish Civil War. I would probably also talk about the newly-established German Air Force and how it bombed the Spanish city of Guernica in April 1937. In supporting Francisco Franco, the fascist leader of Spain, Germany used Guernica to practice the techniques of air warfare that they would later use in the blitzkrieg of World War II. In attacking Guernica, a city of 7000, the Germans injured 900 Spaniards and killed 1700. If students know that minimal amount of information, they should be able to glean much meaning from the painting. Next, show students the work of art and ask them to answer three questions. What details in the painting catch your attention? What questions of curiosity are sparked by the painting? What conclusions can you make that are based on information in the painting? Take note that these questions are designed to encourage students to examine the painting closely and come to their own conclusions about the rise of fascism. As always, history teachers should avoid teaching students what to think and instead teach them how to think. If students need more time for research, provide that time after they have examined the painting closely (required by question #1), created a list of questions they want answered (required by question #2), and come to a few conclusions independently (required by question #3). In my experience, student research will be much more focused after they have already completed their analysis of a work based on the three questions. In Guernica, Picasso supplied several images of what happened to the one town after the bombing. From the image of the woman holding a dead child and screaming into the air to the single light shining upon the atrocities, Picasso created a touching portrait of human suffering that will most likely engage the hearts and minds of anyone who examines the images closely. Picasso also used the bombing of Guernica to create a painting that was anti-fascist and anti-war, a painting that portrays the cruelty that human beings can inflict on each other. As a teacher, I have never had to explain all that to students. Most students are able to figure it out by answering the three simple questions listed above. Additionally, students usually extract meanings from the painting that I have overlooked. The approach that I have outlined can also be used to ask students to synthesize historical information and make a comparison between Guernica and other works of art from other historical eras. 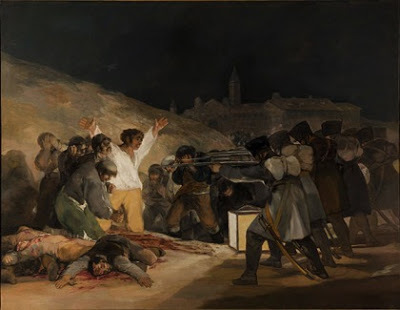 In the case of Guernica, for example, I might ask students to compare and contrast Picasso’s painting with Francisco Goya's The Third of May, 1808 (1814). Although the two paintings were created almost 125 years apart, they were both painted by Spaniards, and they both offered similar themes and images inspired by similar events. I must admit that writing about all this makes me miss my work with high school students. I can’t help but think about how much fun I had listening to students talk about Guernica and The Third of May. What my students taught me was always far more than I ever taught them. As a postscript, I have an assignment for the readers of this blog. I ask that you watch the 3-D animation of Guernica embedded below and answer the three questions as you watch the video. If all goes as I expect, you should be inspired to learn much more about the events and themes surrounding Picasso's masterwork. Question: How can history teachers possibly cover everything required by the curriculum? Let that answer be liberating! Teachers who try to cover everything will likely fail, leaving little time to help students understand the complexities of history and develop academic skills at the highest levels. Teachers must also keep in mind that the amount of material covered does not necessarily equal the amount of material students learn. The question that began this article should be revised: How can teachers cover enough information and still leave time for students to explore significant topics in depth? The answer to that question can be found in my six suggestions for balancing depth and breadth in a history classroom. Rather than trying to cover everything in the textbook (the ball-of-string approach), focus on helping students develop their academic skills while exploring a few well-selected historical topics in depth. Think of the history curriculum as a series of topics that can be explored in depth and then use those topics to help students develop reading, writing, and thinking skills. Provide students with historical documents and reading assignments that prompt students to ask questions and make inferences on their own. Help students learn to be independent thinkers and learners. Require students to write often. Writing assignments should require students to make assertions and then defend those assertions with specific, accurate, and relevant historical information. Use “essential” or "big picture" questions to focus attention on significant issues and topics in history. Begin each unit with a question or statement that address an essential issue for the unit. The answer to an essential question should be open to interpretation, and the question should help students focus their attention on what most matters in the unit. Throughout the unit, encourage students to link historical information to the essential question. Note: Essential concepts or themes can often be taken from state or local standards and benchmarks. Begin each unit with a quick overview of important people events, terms, and dates that are essential to understanding the unit. Begin each unit by providing students with a study guide containing a list of essential information for the unit. The study guide should narrow the unit down to the basic information that every history student should know. Students should then complete the study guide with information gleaned from textbooks, lectures, research, and classroom activities. Cover essential information at the beginning of each unit as quickly as possible. Leave enough time during the unit to explore some topics in depth with supplemental readings and original source documents. Avoid being overly dependent on the textbook. Work toward creating a history class that uses the textbook primarily as a reference book. Select readings from the textbook that prompt an in-depth study of a historical topic that will help students develop analytical thinking skills. Select pictures, graphs, and original source documents from the textbook that will help students develop their analytical thinking skills. Note: The suggestion to avoid being overly dependent on the textbook is much easier to achieve for experienced history teachers. New teachers are advised to use a good textbook as a guide to essential historical content. Reduce the breadth of content covered. Reduce the emphasis on memorization of historical information. Require a greater depth of study within a smaller number of topics. In the spirit of helping history teachers become more self-aware I present these questions for building a history curriculum. They are questions that every history teacher must eventually confront, questions that help history teachers evaluate themselves and create better lessons for students. 1. Why are students taking your class? Is it a required class? Is it an elective? Are students taking the class because they are interested in the subject? Are they taking the class because they have heard you are a good teacher? 2. What are your curriculum priorities? Are you primarily concerned with following administrative standards and covering the content? Are you primarily concerned with providing historical knowledge or helping students develop academic skills? Are you hoping that students simply “enjoy” the class and learn to love history? 3. How will you decide what information to cover? Will the textbook dictate content? Will state or district mandates decide what you teach? Will you be following an academic consensus about what students should learn in a history class? 4. What approach will you take in covering historical information? Will you take a traditional chronological approach? Will you take a topical or thematic approach? Have you thought about teaching history backwards and following historical strands that begin with the present? 5. Which historical theme(s) will your curriculum emphasize? Will your presentation of themes fall primarily under the category of political, economic, social, cultural, intellectual, religious, diplomatic, or some other significant theme. 6. How will you decide which topics are studied in depth? Is political history more important than social and cultural history? Is early history more important than current history? Can you skip some topics? 7. What textbook(s) will you use? 8. What supplemental sources will you use? 9. What primary sources will you use? 10. Will you incorporate literature, film, art, or music into the curriculum? If so, what will you use? 11. How will you deliver basic historical information? Will students obtain information primarily from the textbook, lectures, PowerPoint presentations, or some other source? 12. What teaching strategies will you use to motivate and engage students? 13. What academic skills will you emphasize? Will your class focus primarily on developing reading, writing, or thinking skills? Are there other skills you want to help students develop, such as computer skills or social skills? 14. Will you incorporate technology into the curriculum? If so, how? 15. How will you handle controversial issues? 16. How will you evaluate students? Will you evaluate students primarily through the products they create (written or constructed), their performances (role playing, oral reports, simulations), exams (multiple choice or constructed responses), or some other means of evaluation. 17. How will you keep learning and growing as a history teacher? 18. How will you keep yourself motivated as a history teacher? 19. What is the higher purpose of what you will try to achieve as a history teacher? What is the value of teaching and studying history? 20. What is your personal mission statement as a history teacher? Is knowledgeable about history and loves learning history. Is able to explain the importance of studying history. Provides an in-depth study of selected topics and avoids teaching history as a laundry list of information. Explains the relationship between fact and conjecture. Carries significant historical themes and questions from early history to the present day. Is able to deal with controversial issues. Offers students opportunities for active learning and questioning. Uses primary source materials including diaries, letters, newspapers, photos, music, clothing, works of art, and other historical artifacts. Engages students with literature, art, music, and biography. Covers course content in the time available. Explains what has been left out of the history course and why. Helps students develop basic academic skills. Asks questions that require analytical thinking and problem solving. Uses diverse strategies for teaching history. Presents a study of people from diverse backgrounds and conditions, as well as an understanding of what binds all of us together as human beings.